So we are here again, following our post last week '#HUNTtheTRUTH hype train has no breaks'. Yesterday, Aaron Greenberg simply tweeted #HUNTtheTruth followed by 2 pictures, one of Master Chief and the other of Locke. Its not even a real question for me....although I obviously dont know the details its pretty transparent to me that Chief isnt a traitor. Lol. I saw something funny on twitter and xbox one sub reddit the other day. Seems Halo fans are picking sides now. Team Locke and Team Masterchief. Lol. Can't wait to know more about this game. I sure hope MC isn't a traitor though. OK Chief might be a traitor to ONI but not in as far as doing anything to jeapordize the fight for humanity. How can you really believe otherwise after all he has done to protect humanity? If he is a traitor then I'll be a traitor with him. Same, I'll riot if they kill him off. Hehe well said. Master Chief is a boss. You think I'm going to side with some Oni scum? Lockes armour is coooool. Next generation spartan. All hail The Master Chief!!! I must admit, I wrote the article but.. I can not see Microsoft allowing 343 to make one of their brand Icons into a traitor..
That being said if they did turn Chief into a heel, it would sell sell sell! Depends on who he's suppose to be loyal to... ONI is not a good entity, so if MC 'betrays' them, it's probably justified. 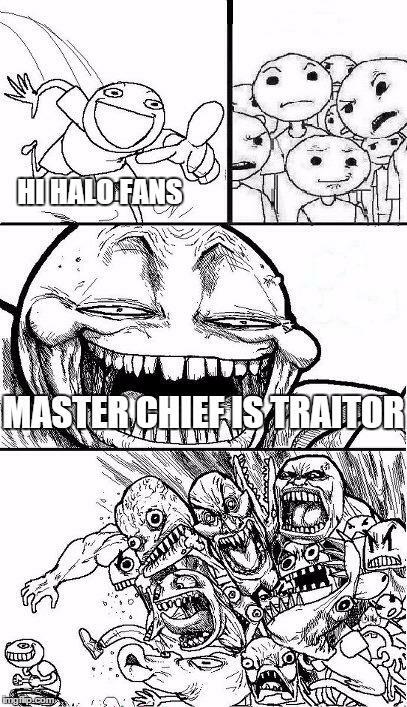 There are so many conflicted relationships in the halo universe, that the word traitor is almost too general to be an insult. Exactly. It's all perspective. Maybe MC realizes that he's been on the wrong side all along, or that those he has always taken orders from have nefarious plans. What if the government is the traitor setting MC up. The Illuminati could be involved. No, but he will have a reason to become one. Traitor to who? What did he do in Halo 4 that's made him a traitor? Well, actually, he refused to retire so he can fight alongside Blue Team. This isn't a welcome decision, apparently. But I feel like the actions of Cortana in Halo's 2 & 3 are going to bite the Master Chief hard than just refusing to retire. Hint: "Okay. Shoot. *screen turns black*"
It wasn't Halo 4 that made him a traitor. The going speculation right now is that, after the emotionally traumatic events that happened at the end of Halo 4 regarding a certain other character to whom he was close (avoiding spoilers), he abandoned the UNSC and went AWOL. The theories diverge at that point. Did he leave to search for answers? Did he leave to search for Dr. Halsey? Why did he go? Ostensibly, that's what Agent Locke is sent to find out. Locke: "He's gone AWOL, and the USNC want him back. I'm going to bring him home." Arbiter: "... but if he has left the fold, I'm sure he has his reasons." Locke: "I'm sure he does, Arbiter, and I intend to find out what they are." I was there man...I was THERE! Based on the lore I'm guessing the Usnc is going to make him out to be a traitor but will be doing the right thing. I just finished beating Halo 4's campaign again on the xbox one. How that game didn't win game of the year in 2012 is a travesty. Easily one of the best FPS's of the last 5 years. I still can't comprehend how people say that game was bad. From the graphics, to the enemies, to the story, to the guns, to the gameplay I have no clue how any one can say that game was bad. Nobody that had actually played it says it's bad I think it's just those few that haven't played it trying to make themselves feel better. Halo 4 has one of the best campaigns in the whole halo universe and in all of gaming Imo. 343i took a lot of risks. They added another weapon type. They pushed the 360 to it's limits with the engine 4 was running on. They made Sprint a Spartan ability. They created the most aggressive Halo AI with the Promethean. They made Halo far more gritty. They killed off an iconic character. These are a lot of risks which blew me away that they're willing to take them and make an amazing game. For the next 30 years 343i will continue making Halo darker and more interesting than ever before. It started out a bit dull imo, but quickly became pretty awesome, though the campaign was a bit short. My main problem with the game was the multiplayer. I have a feeling Master Chief is going to be a very different person now. Even in his commercial with Locke he sounds like a man out for vengeance and doesn't care who gets in his way. Especially if you know what the Librarian did to him in Halo 4 actually was. God I have to find time to play HMCC. I've only ever played Halo 1. I have no idea what the plot line is, but the recent You Tube ad I saw had MC all beat up and some guy standing over him saying he had to "save the world" from MC. and Halo 4 is 87 meta. The people that are hating on it are the same people hating on FH2 or SSOD. IE people that have never owned an xbox. I'm definitely Team Jacob on this one. Nope ,117 is no traitor, now Locke thats different. Can't wait to put him down . im guessing currupt government get caught by chief and they send someone to kill him. OR chief just goes insane and believes humans can't be trusted anymore. Let's just spoil the story why don't we. I don't want to know anything before I play it!